The new W.P. 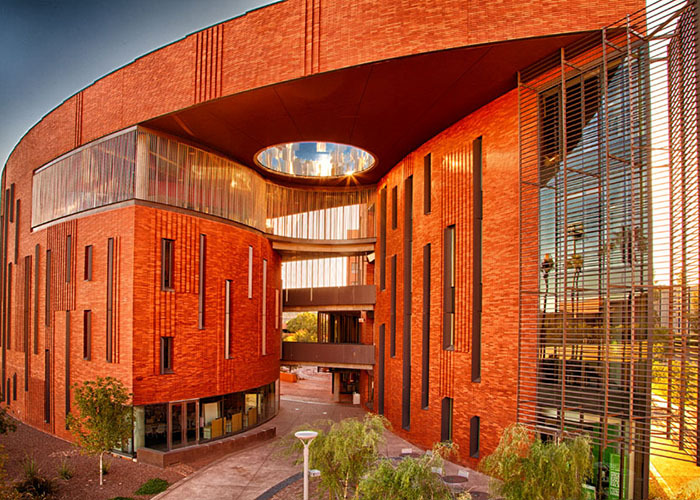 Carey School of Business McCord Hall is a stunning piece of architectural design, but its beauty is more than skin deep. It’s got good bones. Great care went into the planning, design, and construction of this project, which is actually two four-level buildings linked at each floor by a long-span open skyway constructed with radiused cast-in-place concrete T-beams. 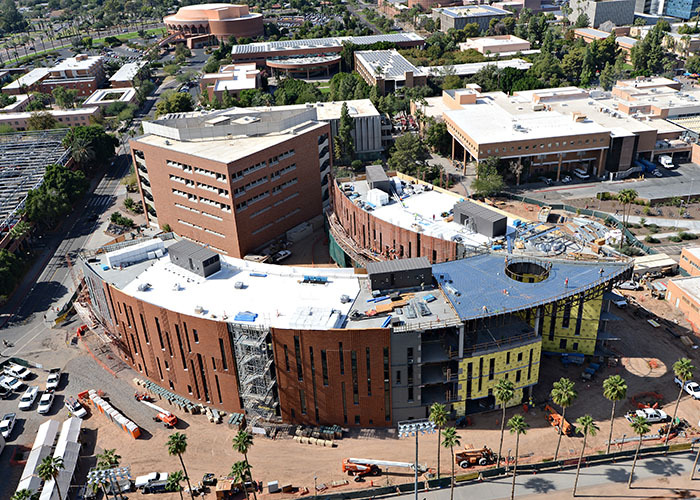 Together the two structures contain 128,000 square feet of space divided into a variety of functions, including 14 tiered amphitheater-style classrooms, 50 team study rooms, four flat-configured classrooms, conference facilities, student lounges, café, and a career center. 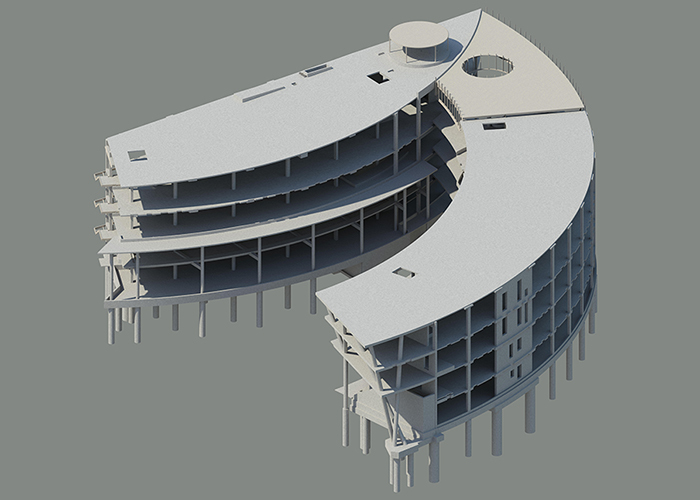 Each building has a unique post-tensioned solution that consists of a two-way flat plate design for the north building and a one-way slab with shallow dropped beams at each radial grid on the south building. Because the concrete specialty detailing and finishing was extremely important to the client, MBJ produced many formwork solutions to express radial, tapered, layered, sloped, colored, and rounded conditions that are pleasing to the eye. Concrete was also the material of choice for the new water fountain, site walls and benches in the Business School courtyard. The LEED Silver project is designed to be a reusable structure that can be repurposed without having to be demolished for up to 100 years. Other sustainable features include reduced water usage and solar roof panels that return power to the campus grid. 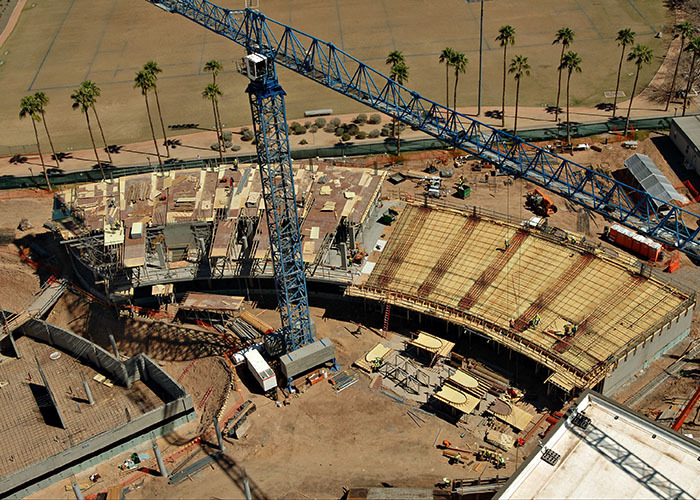 The project won an AZRE RED Award for Best Public Project and two awards from the American Concrete Institute Arizona, Best Overall Project and Exposing the Best in Concrete.